These are quick, and easy-to-knit, Christmas tree ornaments that you can hang from the Christmas tree, wear on your lapel, or use as package trims. The lovely picture of a knitted Christmas tree decorated with sparkling beads was submitted by Tara, a reader (and new knitter) who graciously allowed me to use her photograph. I think it looks wonderful; very few store-bought ornaments would have the same warm appeal. small amount of pillow stuffing , or cotton balls. 1 pr. US size 7 needles. Starting at bottom of tree, with color desired for tree, cast on 15 sts. Row 2 : K 1, K 2 tog, K across row. Row 3: K 1, P 2 tog, P across to last st, P 1. Row 8: Cast on 2 sts at beg of row, then K 1, K 2 tog, K across row. Row 9: Cast on 2 sts at beg of row, then K 1, P 2 tog, P across to last st, K 1. Row 14 : Repeat row 8. Rows 16 & 17: Repeat rows 2& 3. Repeat these last 2 rows until 3 sts remain. Turn, then knit these last 3 sts tog. Make another tree side in same manner. 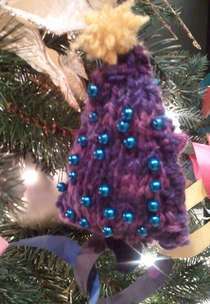 Embroider stars, ornaments, or sew on beads , small buttons as desired, on front of tree. Sew the 2 sides of trees tog, leaving bottom open. Stuff lightly with pillow stuffing, then sew bottom closed. Sew on a hanging loop at top of tree ornament. With dark color yarn, cast on 4 sts. K 2 rows, bind off. Sew narrow end of trunk to bottom center of stuffed tree. This free knitting pattern is supplied with the compliments of href=”http://www.frugalhaus.com”>Frugal Knitting Haus.